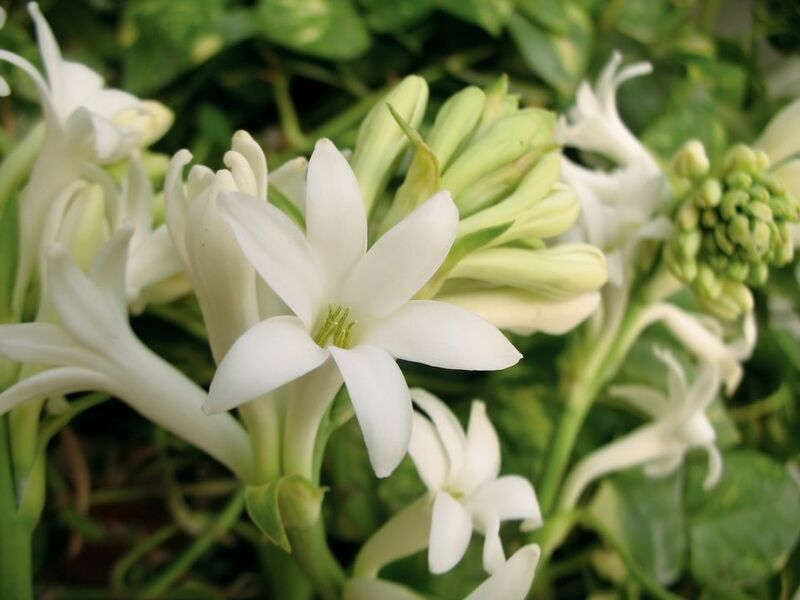 You can duplicate the look of tuberose flowers in your garden with many other small, white flowers, but no other bloom has quite the same intoxicating perfume, although some compare the scent to gardenias. Gardeners describe the fragrance of this South American flower as exotic, spicy, floral, and sweet, and the price for one ounce of the essential oil can start at $600 or higher. However, you can enjoy the fresh fragrance of this popular wedding flower for a few dollars, and a little bit of sweat equity, by growing the tuberose in your garden. The plant family Agavaceae includes the genus Polianthes, a small group of about a dozen plants that includes P. tuberosa. Hardy in zones 8-10, these Central American natives are not frost-tolerant and are therefore grown as annuals. Tuberose foliage has grassy foliage that grows two to three feet tall and is similar in appearance to daylilies. Each stem can bear a dozen or more white blooms in mid to late summer, which may remain closed if the heat is particularly stifling. True to its agave heritage, the flowers are slightly waxy, offering protection against desiccation, but the blooms can still shrivel in direct sun when temperatures are 95 F or greater. If this sounds typical of your summers, plant the bulbs where they will receive some afternoon shade. In northern climates, tuberoses may not bloom until the latter part of August, but you can start the bulbs indoors in early spring to give them a head start. However, the bulbs are easy to start outdoors, if you’re patient enough to wait three to four months for the first blooms. Choose a planting location featuring soil with good drainage in a sunny location. Space the bulbs six inches apart, and cover them with two inches of soil. Make sure the bulbs get a weekly drink, either through rain or irrigation. Although tuberoses need full sun to reach their blossoming potential, they don’t like to bake in parched soil. Keep your tuberoses moist with the help of a 3-inch mulch layer. Tuberoses are moderate to heavy feeders. Apply a slow release granular fertilizer at the beginning of the season. A 5-10-5 fertilizer will provide the necessary phosphorus to encourage flowering. At the end of the growing season in zones 6 and colder, you’ll have to decide if you want to save your tuberose bulbs for next year. If so, dig them up, let them dry, and store them in a cool place. Plant tuberose bulbs close to your mailbox or front door, where you’ll enjoy their perfume frequently. Add several tuberoses to your container garden for fragrance. Single Mexican: Easiest to grow and earliest to bloom. Double Pearl: Every bit as fragrant as the single variety. Plants are shorter, flowers have blush tips, and blooms are fully double. What Are the Green Bells of Ireland?